Musicians can be tough to buy for. There are so many things they need... picks, strings, sticks, little boxes with...lights and buttons and switches... How are you to know what to get for them as a gift? 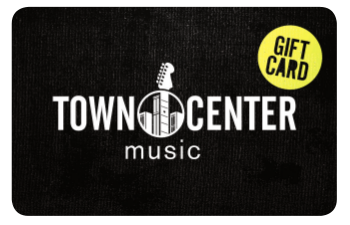 Fear not, good gift-giver, because Town Center Music offers gift cards. Use them for lessons or merch - we’re sure to have something your favorite music-maker wants. We've got our most popular denominations here on our website, or you can give us a call and we can do any denomination over the phone. We can also ship or mail your card anywhere in the continental United States. See, doesn't that make life just a little bit easier?